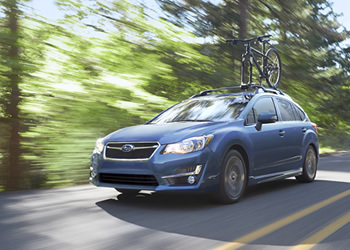 "2015 TOP SAFETY PICK (TSP) +"
● The 2015 Legacy, Outback, Forester, Impreza and Subaru XV Crosstrek with optional "EyeSight" received the IIHS' highest standard of safety, the 2015 "TSP+" award and the highest possible rating of "Superior" for front crash prevention. ● Only the Impreza and Subaru XV Crosstrek achieved "Superior" in the small car category. ● Seven models have earned 2015 safety awards from IIHS. *: Subaru models currently sold in the North American region.